February 16, 1904 James Baskett, actor and the first male performer of African descent to receive an Oscar, was born in Indianapolis, Indiana. Baskett appeared on Broadway in the all-black musical revue “Hot Chocolate” in 1929. He also appeared in a number of all-black films, including “Harlem is Heaven” (1932) and “Straight to Heaven” (1939). From 1944 to 1948, he was part of the cast of the “Amos ‘n’ Andy” radio show. 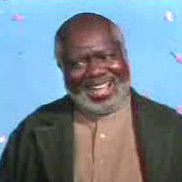 In 1946, he appeared in the lead role of Uncle Remus in “Song of the South,” but was unable to attend the premier in Atlanta, Georgia because of the city’s racial segregation laws. In 1947, Baskett received an honorary Academy Award for his performance as Uncle Remus for his “able and heartwarming characterization of Uncle Remus, friend and storyteller to the children of the world.” Basket died July 9, 1948.